We’d love your help. Let us know what’s wrong with this preview of The Retribution by Val McDermid. There is one serial killer who has shaped and defined police profiler Tony Hill's life. One serial killer whose evil surpasses all others. One serial killer who has the power to chill him to the bone: Jacko Vance. And now Jacko is back in Tony's life - even more twisted and cunning than ever before. Longlisted Theakstons Old Peculier Crime Novel of the Year 2012. To ask other readers questions about The Retribution, please sign up. I am curious why people choose to read 7th book in a series without having read the first 6. Why do GoodReads prioritise reviewers who haven't bothered reading first 6 but feel fit to pronounce on this? I understand many people depend on libraries and charity shops to quench their voracious reading appetites, but this series has been going 20 years, less than one every 2 year. A bit of patience won't hurt! Steph In my case, I wasn't aware it was the 7th in the series. I got this book as a free or cheap ebook (and the other 6 didn't come with it). Jacko Vance was first introduced in The Wire in the Blood, and quite a despicable human he is. Twelve years he’s been in prison thanks to Carol Jordan and Tony Hill. Twelve years he’s plotted and planned his revenge. I believe his prison escape plan is highly implausible, but I gave Val McDermid the benefit of the doubt. With a new supervisor, Carol and her very successful team are being split up. One last case comes in and they would like to go out with a bang. This case isn’t completely dropped Jacko Vance was first introduced in The Wire in the Blood, and quite a despicable human he is. Twelve years he’s been in prison thanks to Carol Jordan and Tony Hill. Twelve years he’s plotted and planned his revenge. I believe his prison escape plan is highly implausible, but I gave Val McDermid the benefit of the doubt. With a new supervisor, Carol and her very successful team are being split up. One last case comes in and they would like to go out with a bang. This case isn’t completely dropped, but it does get overshadowed by Vance's escape. McDermid created a sense of doom with Vance's plans for retribution, which kept me alert. The results varied from gruesome to mildly upsetting. I admit Carol has always seemed a bit cold in my opinion, and I think she overreacted toward Tony in this book. She also accepted none of the responsibility. I’m really not happy with her now. Tony seemed to fold under her harshness. I'm wondering why he bothers with her. The Retribution by Val McDermid is the seventh in a series featuring detective Carol Jordan and profiler Tony Hill. In the interest of full disclosure, I won this in a first-reads GR giveaway. However, my review reflects my experience of the book and is not (I don't believe) influenced by this in any way). I have not read the rest of the series which may in some ways be a disadvantage but which I found believe increased my reading pleasure-I found the references to other stories and back stories The Retribution by Val McDermid is the seventh in a series featuring detective Carol Jordan and profiler Tony Hill. In the interest of full disclosure, I won this in a first-reads GR giveaway. However, my review reflects my experience of the book and is not (I don't believe) influenced by this in any way). I have not read the rest of the series which may in some ways be a disadvantage but which I found believe increased my reading pleasure-I found the references to other stories and back stories increased my interest in the current story, adding to the general ambiance and mystery. The book is extremely well-written and generally well-paced (although it dragged a little during the last quarter or so) and the characters interesting, especially since it was my first encounter with them. Much of the story and characterizations are familiar with fans of serial killer/profile television shows (such as Criminal Minds) and so my unfamiliarity with the setting and people involved brought a freshness which I don't know whether followers of the series feel. I enjoyed the book greatly and found it sufficiently interesting to want to read others in the series. Tony Hill was of particular interest to me. He seems somewhat autistic or Aspergery and I wanted to know more about his relationship with his mother. This is a major reason I want to read more of the series. I was really disappointed with this book. Definitely my least favorite McDermid novel (and I've read the entire Tony Hill/Carol Jordan series and all of her standalone thrillers). As another reviewer noted, it almost seems like she wrote this book merely to punish all the readers who had become invested in Tony and Carol's relationship, which had always had an air of uncertainty about it but which, by Fever of the Bone, felt like it was finally starting to move in a positive direction. She quick I was really disappointed with this book. Definitely my least favorite McDermid novel (and I've read the entire Tony Hill/Carol Jordan series and all of her standalone thrillers). As another reviewer noted, it almost seems like she wrote this book merely to punish all the readers who had become invested in Tony and Carol's relationship, which had always had an air of uncertainty about it but which, by Fever of the Bone, felt like it was finally starting to move in a positive direction. She quickly undoes that progress with this book. The events that take place not only make it seem impossible that Tony and Carol will be able to find their way back to each other, they also make it seem highly unlikely that either one will know peace or happiness ever again. And all this just to revisit an old villain, who in this book came across as rather one-dimensional and not especially interesting. Much of the book seemed to drag until about two-thirds of the way through, when suddenly it started barreling forward like a freight train, wrapping up plot lines so quickly and with so little detail that it was quite a letdown. The secondary serial killer case in particular felt rushed and under-developed. I've been a big fan of the Hill/Jordan series, but I almost wish she had just ended it with Fever of the Bone. I'm not sure I'll read any more if she continues the series. I don't think I want to spend any more time with the irreparably damaged people these two have become. The Retribution is another murder mystery that was free on the Nook recently. It is very definitely not a cozy, however. It's the most recent in a series of books starring police detective Carol Jordan and expert profiler Tony Hill; in this book, a serial killer that Jordan and Hill put away years ago escapes prison and comes back to get his revenge. If you are a fan of the Jordan/Hill series, then I would say you can't possibly miss this book; a lot of important stuff happens, and I think if you The Retribution is another murder mystery that was free on the Nook recently. It is very definitely not a cozy, however. It's the most recent in a series of books starring police detective Carol Jordan and expert profiler Tony Hill; in this book, a serial killer that Jordan and Hill put away years ago escapes prison and comes back to get his revenge. If you are a fan of the Jordan/Hill series, then I would say you can't possibly miss this book; a lot of important stuff happens, and I think if you're invested in the characters, much of the book will be a series of gut-punches, but gut-punches you would be sorry to miss (kind of like Changes was for Dresden Files fans). For me, though, this is (and shall remain) the only book I've read in the series. There are two main reasons for that: (1) the gore. THE GORE and (2) the ending. The gore was pretty awful, but it actually didn't bother me that much because I don't read gory stuff very often (kind of like how I find Criminal Minds fascinating for one episode, but a marathon would give me nightmares). Up until the last few chapters, I was invested enough in Carol and Tony's relationship and their lives and friendships and history that I was considering reading the first six books in the series. But then, the ending. The ending was aggressively anticlimactic. Not the kind of anticlimactic where the author isn't skilled - the kind where the author actively hates the characters she's created and hates the readers for demanding more about them. "Oh, you wanted more?" the ending seems to say, "WELL, HERE'S YOUR MORE. ARE YOU HAPPY NOW?!?" No, Ms. McDermid. No, I am not happy. So if you're not already a fan of Carol Jordan and Tony Hill, I don't recommend this book at all. And with how their story ends, I also don't recommend becoming a fan. I discovered Val McDermid back in the early 1990s when the first of her Kate Branigan series, Dead Beat was published. I've been a fan of her work ever since and have always looked forward to reading her next book. This is the seventh book in the Tony Hill / Carol Jordan series, the first of which, The Mermaids Singing, was published in 1995. The fact that this is only the seventh book in the series demonstrates that McDermid doesn't churn them out, factory-fashion. In recent years she has inter I discovered Val McDermid back in the early 1990s when the first of her Kate Branigan series, Dead Beat was published. I've been a fan of her work ever since and have always looked forward to reading her next book. This is the seventh book in the Tony Hill / Carol Jordan series, the first of which, The Mermaids Singing, was published in 1995. The fact that this is only the seventh book in the series demonstrates that McDermid doesn't churn them out, factory-fashion. In recent years she has interspersed the books in the series with stand-alone thrillers that have generally been high quality reads. Most of the novels in the series have also been well-written and gripping thrillers. So it was disappointing to read the latest installment and feel distinctly underwhelmed, all the more so because I expected to enjoy it very much. In essence, this is the story of the escape from prison of serial killer, Jacko Vance, in whose capture and imprisonment forensic psychologist and profiler Tony Hill and police officer Carol Jordan were instrumental in the second novel in the series, The Wire In The Blood. Vance plans to leave England, but not before he takes vengeance on those responsible for his incarceration. Added to the main narrative is that of another serial killer, who is killing prostitutes in particularly gruesome ways. The novel starts with Vance’s escape from prison, an incident of breath-taking implausibility. There’s nothing startling about implausibility in crime fiction. Indeed, if readers can’t cope with implausible, then they probably should be reading a different type of fiction. But for me, this particular prison escape strained credulity so much that I had difficulty accepting the details of Vance’s subsequent revenge spree with anything approaching suspension of disbelief. In addition, the secondary serial killer story felt tacked on and irrelevant and the resolution of both strands of the narrative seemed rushed and unsatisfying. Overall, I felt let down by the plot. It promised much and delivered little. What kept me reading was the characters. McDermid is very good at creating characters readers can care about. Her central protagonists, Tony Hill and Carol Jordan, are flawed but compelling. The secondary characters are also very well drawn. McDermid has allowed her characters to grow and change throughout the series, which adds interest to the novels. As a reader I genuinely want to know where she will take them. I’m worried about my reaction to this particular instalment in the series. I have often stopped reading a series because I’ve become bored and stopped caring what happens next. With this series, I still care about the characters. However, my tolerance for far-fetched serial killer stories has decreased over time. That doesn’t bode well for my future enjoyment of Val McDermid’s novels. But I’ve spent almost twenty years reading and (mostly) enjoying her work and I want to keep on liking her books. So I’ll keep reading them for a while yet, in the hope - in the fervent hope - that my disappointment with this novel is just a glitch. This is a 3 star read because McDermid writes good prose and creates great characters. Otherwise it would be closer to 2-1/2 stars. If I were a teacher and this were a school report, I’d be writing “Could do better”. This review has been hidden because it contains spoilers. To view it, click here. After reading this and thinking about it for a while, I'm still not entirely sure what I think of it. There was much to enjoy but at times I still felt like throwing the book across the room, a feeling I think would have been much worse had I not been spoiled for the end of the book. As a long time reader, I was pleased to see movement in the Carol/Tony relationship, even if it did backslide in a major way in the latter half of the book. I was also pleased to see Jacko Vance back again though I' After reading this and thinking about it for a while, I'm still not entirely sure what I think of it. There was much to enjoy but at times I still felt like throwing the book across the room, a feeling I think would have been much worse had I not been spoiled for the end of the book. As a long time reader, I was pleased to see movement in the Carol/Tony relationship, even if it did backslide in a major way in the latter half of the book. I was also pleased to see Jacko Vance back again though I'm not entirely sure the book did that storyline justice, competing for space as it was with the B plot. I didn't quite get the sense of fear that I was expecting for the characters and I think the book would have been much better if it had strictly focused on the Vance storyline. The B plot itself wasn't bad but I felt it didn't get quite enough space. I first discovered Val McDermid’s Tony Hill & Carol Jordan series about 7 or 8 years ago and I have been a dedicated fan ever since. The Retribution is not only the latest in the series of seven books but it also reintroduces one of the serial killers from a much earlier book The Wire in the Blood – the evil and twisted Jacko Vance. 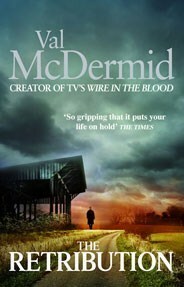 To be honest, I could barely remember a thing about that book so it wouldn’t make any difference to reading this book out of sequence if you haven’t read McDermi I first discovered Val McDermid’s Tony Hill & Carol Jordan series about 7 or 8 years ago and I have been a dedicated fan ever since. The Retribution is not only the latest in the series of seven books but it also reintroduces one of the serial killers from a much earlier book The Wire in the Blood – the evil and twisted Jacko Vance. To be honest, I could barely remember a thing about that book so it wouldn’t make any difference to reading this book out of sequence if you haven’t read McDermid’s earlier ones yet. The fact that both these stories are running in tandem with each other means that not enough time was devoted to either. The prostitute killer felt almost like an afterthought and his ultimate capture was bordering on eye-rolling. The sotry of Jacko Vance’s escape and revenge would have been more than enough to keep us on the edge of our seats and, at times, I was. Waiting to see who would feed Carol Jordan’s cat (it will make sense when you have read it, I promise) had my pulse racing overtime and trying to figure out who was next on his hit-list was great stuff. Jacko Vance is such a brilliantly evil character that despite his psychopathic nature, I wanted to spend more and more time in his company in the book; I had to know what he was thinking and planning on doing next and loved seeing how he doesn’t see anything wrong with himself, just everyone else. However – and it’s with a heavy heart that I write this, being such a fan - I felt that this book wasn’t on a par with others in the series. In fact, Beneeth the Bleeding (two books earlier) was also somewhat lacking and I wonder if Tony Hill and Carol Jordan are finally running out of steam….. or maybe McDermid is? Have read all of the Tony Hill/Carol Jordan books, imo the best of McDermid's work. I like the density of the Bradfield setting, the complexity and nuancing of all the different minorities and majorities and the pretty complete lack of bias against any of them. I also like the GLBT content, and the fact that people of alternate sexuality aren't either idealised or demonised. I like the fascinating up-dates on police technology. I also like the ongoing relationship between Hill and Jordan - a lar Have read all of the Tony Hill/Carol Jordan books, imo the best of McDermid's work. I like the density of the Bradfield setting, the complexity and nuancing of all the different minorities and majorities and the pretty complete lack of bias against any of them. I also like the GLBT content, and the fact that people of alternate sexuality aren't either idealised or demonised. I like the fascinating up-dates on police technology. I also like the ongoing relationship between Hill and Jordan - a large part of what keeps me reading, of course,is the question of what will happen between them. But this book I found for the first time somewhat disappointing. There was a lot of repetitive explanation of background and relationships. There was an offul lot of wind-up to Jacko's actual breakout and malignancies, where nothing much happened except menacing final chapter lines. There was also, once the first attack took place, an alarming lack of foresight among the characters about what he wd. do next. It's the first time I've found myself out-guessing Hill and Jordan consistently, and even picking the ending well before it arrived. (view spoiler)[According to the dust jacket, The Retribution is "the ideal introduction or reintroduction to the world of Tony Hill and Carol Jordan." Well bloody hell, if this had been my first outing with Tony and Carol, I don't think I'd be coming back for more. McDermid's books have always been shocking - borderline grotesque in places - but for me, the stakes were just too high here. Carol's brother murdered, Tony's beloved house razed to the ground, Chris blinded and horrifically scarred fo (view spoiler)[According to the dust jacket, The Retribution is "the ideal introduction or reintroduction to the world of Tony Hill and Carol Jordan." Well bloody hell, if this had been my first outing with Tony and Carol, I don't think I'd be coming back for more. McDermid's books have always been shocking - borderline grotesque in places - but for me, the stakes were just too high here. Carol's brother murdered, Tony's beloved house razed to the ground, Chris blinded and horrifically scarred for life... Often I can't put McDermid's book down. This one I had to put aside in favour of watching a few hours of How I Met Your Mother, because it was just too flipping grim. Not to mention the Tony/Carol element. After a few books of total stagnation in their relationship, the last instalment gave me some hope for forward momentum. And instead, here we take a step back so enormous, it's hard to see how the lost ground can ever be recovered. On the whole, it's hard to say I enjoyed this book, because it was just so distressing. The pacing in the second half was tense, edge of seat stuff, but the first few hundred pages were dismayingly slow - particularly when we spent a chapter with Vance escaping, a chapter with Tony learning Vance had escaped, then a chapter with Tony telling Carol Vance had escaped... Eesh. The secondary plot started out with promise, but fizzled out by the end. This review has been hidden because it contains spoilers. To view it, click here. I couldn't wait to read "The Retribution", but almost as soon as I began, I had this horrible feeling that something really bad was going to happen. I was convinced either Tony or Carol would end up dead by the last chapter, but I couldn't stop reading. Val McDermid has never made any secret that she hates the idea of Tony and Carol in a relationship, but she gave us all hope with the ending of "Fever of the Bone". Was her choice of title for her latest novel a dig at us poor Tony/Carol fans? Whi I couldn't wait to read "The Retribution", but almost as soon as I began, I had this horrible feeling that something really bad was going to happen. I was convinced either Tony or Carol would end up dead by the last chapter, but I couldn't stop reading. Val McDermid has never made any secret that she hates the idea of Tony and Carol in a relationship, but she gave us all hope with the ending of "Fever of the Bone". Was her choice of title for her latest novel a dig at us poor Tony/Carol fans? Maybe I'm overreacting, but I believe that when you're a writer, the characters aren't solely yours. Once you put them on paper and share them with the world, your claim on them loosens. Now, I've got no problem with Ms. McDermid's propensity for torturing her characters, but I like to see some kind of payoff for them at the end. If this truly is the last chapter for Tony and Carol, after all that they have been through together, then I'm afraid, Ms. McDermid, that you've lost a fan. Although I prefer reading from the beginning of any series, even if each book can adequately be read and enjoyed as a stand-alone, I began in the middle here. In the future, I will read the first in the series to determine if my misgivings about The Retribution might be allayed by reading the titles in order. I did understand the back story of Tony Hill's extraordinarily emotionally brutal childhood, but even that didn't answer the questions that came to my mind as to his lack of professionalism Although I prefer reading from the beginning of any series, even if each book can adequately be read and enjoyed as a stand-alone, I began in the middle here. In the future, I will read the first in the series to determine if my misgivings about The Retribution might be allayed by reading the titles in order. I did understand the back story of Tony Hill's extraordinarily emotionally brutal childhood, but even that didn't answer the questions that came to my mind as to his lack of professionalism in the case at hand. In fact, since Hill's professional life provides him his comfort zone, I was disappointed in his inability to concentrate on the life-threatening cases before him. In her twenty-fifth novel, Val McDermid brings back Jacko Vance, introduced to readers in “The Wire in the Blood,” and to television viewers in its wonderful series adaptation. As the book opens, this truly malevolent serial killer, whose resume includes “killer of seventeen teenage girls, murderer of a serving police officer, and a man once voted the sexiest man on British TV” as well as an Olympic athlete and an outwardly charming and charismatic man, has served over 12 years in prison, owing In her twenty-fifth novel, Val McDermid brings back Jacko Vance, introduced to readers in “The Wire in the Blood,” and to television viewers in its wonderful series adaptation. As the book opens, this truly malevolent serial killer, whose resume includes “killer of seventeen teenage girls, murderer of a serving police officer, and a man once voted the sexiest man on British TV” as well as an Olympic athlete and an outwardly charming and charismatic man, has served over 12 years in prison, owing mostly to the efforts of DCI Carol Jordan and psychological profiler Tony Hill. Vance has spent most of that time meticulously planning his escape, as well as his future after its successful completion: the revenge suggested by the books title, directed toward those who had caused his imprisonment, first among them Jordan and Hill, as well as his ex-wife whose betrayal he sees as making her equally culpable. Of course, his plan for vengeance merely begins there. Carol Jordan, as yet unaware of what is about to happen, is dealing with a shake-up at the Bradfield Metropolitan Police, where the powers that be are disbanding her Major Incident Team. In an attempt to go out in a ‘blaze of glory,’ they are faced with finding a killer who has been killing street prostitutes in gruesome ways, and branding them with a distinctive tattoo on the wrist of each. Suddenly, Jordan’s priorities change with Vance’s escape, and its implications. Tony’s priorities as well must be divided between these investigations. The relationship between Jordan and Hill has always been difficult to define, becoming more so all the time. They are not quite lovers, although they share space, and different flats, in Tony’s house. But their emotional entanglement has always been obvious to all, even if they themselves do not admit to one. That relationship, both professionally and personally, is about to be threatened now as never before. The author goes into more of Tony’s background, and the emotional and psychological paths that have shaped him, and caused him to work at “passing for human,” than I remembered having been done in the past. He tells a colleague “I won’t deny that the people who do this kind of thing fascinate me. The more disturbed they are, the more I want to figure out what makes them tick.” It is his empathy and his oft-times brilliant insights that have made him so successful. But this is a challenge unlike any he has ever faced. The pace steadily accelerates along with a sense of dread as Vance begins to carry out his plans, and the resultant page-turner is as good as anything this acclaimed author has written. Highly recommended. Tony Hill and Carol Jordan return for what I hope is their last outing; McDermid has pushed them to extremes over the last sixteen years and there is very little that she can do with them from here. The suspense and tension in this novel are predicated on both characters being terrible at their jobs, and so it doesn't quite work. The conclusion is thematically impressive but possibly dramatically unsatisfying for the lay reader. By this time, we're entirely too familiar with the characters' quirk Tony Hill and Carol Jordan return for what I hope is their last outing; McDermid has pushed them to extremes over the last sixteen years and there is very little that she can do with them from here. The suspense and tension in this novel are predicated on both characters being terrible at their jobs, and so it doesn't quite work. The conclusion is thematically impressive but possibly dramatically unsatisfying for the lay reader. By this time, we're entirely too familiar with the characters' quirks and eccentricities, to the point of being irritated by them. I cringe each time Carol picks up a bottle, and Tony has said he's "passing for human" so many times that it frankly has lost all of its meaning. Wow, this was an exciting book, and a real page turner! Jacko Vance, killer from the 2nd book "Wire in the Blood" has escaped prison in a very ingenious way and with the help from outside from Terry Gates he has money and a house to hide in. Now he sets about getting his revenge against his ex-wife, Tony and Carol. The MIT team is being closed down as their boss wants to save money and Carol has accepted a job in Ambrose's group in Worcester. One last case comes their way - the brutal and grueso Wow, this was an exciting book, and a real page turner! Jacko Vance, killer from the 2nd book "Wire in the Blood" has escaped prison in a very ingenious way and with the help from outside from Terry Gates he has money and a house to hide in. Now he sets about getting his revenge against his ex-wife, Tony and Carol. The MIT team is being closed down as their boss wants to save money and Carol has accepted a job in Ambrose's group in Worcester. One last case comes their way - the brutal and gruesome murders of prostitutes. Paula wants Tony to help, but Carol won't allow it, but he does it on the sly. I've read more of Val McDermids Kate Brannigan series than this series featuring Tony Hill and Carol Jordan but I have also watched a dozen episodes of Wire in The Blood which is based on the pair and it is the book of the same name that first introduces the terrifying killer who is seeking revenge in The Retribution. Jacko Vance, celebrity and hero was incarcerated for just a single murder of a teenage girl despite the police being convinced he was responsible for at least seventeen, as well as I've read more of Val McDermids Kate Brannigan series than this series featuring Tony Hill and Carol Jordan but I have also watched a dozen episodes of Wire in The Blood which is based on the pair and it is the book of the same name that first introduces the terrifying killer who is seeking revenge in The Retribution. Jacko Vance, celebrity and hero was incarcerated for just a single murder of a teenage girl despite the police being convinced he was responsible for at least seventeen, as well as the brutal killing of a colleague who got too close. For the last ten years Jacko has focused his considerable resources of intelligence, patience and money, towards escaping jail and making everyone responsible pay before fleeing the country. His escape leaves clinical psychologist, Tony Hill and DCI Carol Jordan, who have just managed to find some sort of equilibrium in their difficult lives, reeling, especially when it becomes obvious Vance isn't targeting them directly, but the ones they love. The Retribution is a gritty crime novel that delves into the darkness of human nature. While the main plot involves the sadistic behaviour of Vance and the desperate desire to recapture him, DCI Jordan's team is also searching for a serial killer murdering young street prostitutes - a last case before the Major Incident Team is disbanded due to budget cuts. McDermid doesn't spare us the details of the depravity committed by these two very different killers but it is the psychological tension that is so engrossing. The murdered prostitutes are slow to be linked, changes in the method used by the killer confusing the team until the manner of deaths are attributed to a cancelled television show. Vance is playing a cat and mouse game with Carol, Tony and Vance's ex wife, wounding them in ways certain to inflict psychological suffering. That his brilliant plan is eventually thwarted can be no surprise, but exactly who takes down Vance and how is a twist you won't see coming. McDermid's protagonists, Hill and Jordan, are almost as tortured and flawed as the criminals they hunt. Their relationship is complicated, both carry unimaginable burdens that they have struggled to share. Vance shatters their fragile connection and for fans of the series this might be a blow. Though the seventh of the series, The Retribution can be read as a stand alone but readers would benefit from having gotten to know the characters in previous books. The Retribution is a page turning psychological thriller with plenty of twists and turns by Scottish author, Val McDermid. Reading this seventh in the Police Profiler Tony Hill/DCI Carol Jordan series without reading the rest may not be as satisfying as reading them all in order, but I honestly think it can be done. I've only read 3 and didn't feel cheated in the least. I got enough back story to know where I stood and as for the future of the characters, if I get to read the next, so be it, but I won't mind if I don't. Perhaps this is because I am a more of a stand-alone kind of gal. I'd rather not be committed to read the whole of a series as there is so much out there to read. All this being said, I enjoyed Retribution. McDermid has a great way with her characters and her stories are entertaining. There's enough blood and guts for any thriller reader and I found the plot believable and well constructed. I haven't seen Wire in the Blood, the tv program based on the books. I think I might like these. In reading reviews from other fans, some said they didn't like the ending. I really liked where the author left the story. Seemed logical to me. In fact, other than the great interplay in the relationship between Hill and Jordan, the ending might have been my favorite part of the book. I received this book as a digital ARC from the publisher through Net Galley in return for an honest review. Even after watching several episodes of this TV series, this is the first book I read by Val McDermid. The plot is based on the escape of Jacko Vance which aim is to revenge his imprisonment due to a previous work of investigation performed by the Tony Hill and Carol Jordan. Entwined with Jacko's story, Tony and Carol started to investigate a serial killer who murdered street prostitutes and signed his victims post-mortem by making a tattoo on the inside of their wrist. However the reader is driven to focus the attention into Vance’s final goal. Even Tony, an experienced psychologist, made a clear prognostic of Jacko’s mind classifying him as a true psychopath, he wasn’t able to foresee the full dimension of his fury against him and Carol. The author managed to keep reader’s full attention into this chilling and gripping story. This is the seventh book in the Tony Hill and Carol Jordan series. Jacko Vance is back. Ten years ago he was sentenced to prison due to the work of Tony and Carol and now he has escaped and is plotting revenge on the both of them. Tony knows that jacko will be coming after both he and Carol but miscalculates bout the method with tragic consequences. In addition to worrying about Vance, Carol is trying to track down a killer of young prostitues even as her team is being broken up due to budget cu This is the seventh book in the Tony Hill and Carol Jordan series. Jacko Vance is back. Ten years ago he was sentenced to prison due to the work of Tony and Carol and now he has escaped and is plotting revenge on the both of them. Tony knows that jacko will be coming after both he and Carol but miscalculates bout the method with tragic consequences. In addition to worrying about Vance, Carol is trying to track down a killer of young prostitues even as her team is being broken up due to budget cuts. This is probably my favorite book in the series so far. We learn more about Tony's background and also see he is not always correct in his assuptions of the people he is profiling. The mistakes he makes lead to a serious and perhaps final rupture of his and Carol's relationship. I am a big fan of Dr Tony Hill and the Wire in the Blood TV series, this book was great, action and interesting twists right from the start, a few murders along the way with the usual dose of psychological analysis. A good fast paced read if you like the crime thriller genre. Not the best in the Tony Hill series but certainly worth a read if you've been following the series. You cannot read this without reading the preceding books! I listened to this one on audio which I don't do often so not sure if some of the tension was missed due to me listening to it in the car but I just wasn't as gripped by this one as I have been by the rest of the series. Great storyline with a few shockers. The only thing that is annoying is how quick everything is sewn up and finished. Nevertheless, I’ve got the next one in the series sitting beside me.. so book number 8, here we go! Well done Val. Again! See you soon Tony. This is my first book and introduction to Val McDermid and was pleasantly surprised. Love her choice of words! It is ell written! Can't wait to read another. While The Retribution, the 7th book in the Tony Hill & Carol Jordan series could theoretically be read as a standalone I would highly recommend reading the other books first, most notably book 2, Wire in the Blood, as that deals with the same criminal and the events that led up to The Retribution. This review is spoiler free for books 1 and 3-6 but contains spoilers for book 2 (it is impossible to write this review without them I'm afraid). My feelings on The Retribution are very very mixed. As a thriller it works fantastically, and I imagine if you hadn't read the previous 6 books then there would be very little mixed feelings, however I also kind of felt that it was a little unnecessary. Carol and Tony have suffered enough in past books, the events of this one just seemed a little cruel. As normal there are two main crime arcs, a string of murdered prostitutes in Bradfield (the resolution of which was a little "what?!?" but worked at the end of the day) and the revenge of the newly escaped Jacko Vance (who was imprisoned at the end of Wire in the Blood, which I'm guessing is set about a dozen years before this one). Now...Vance's storyline is where I have the kind of issue. I bought into his plot for revenge, and the way he took revenge worked well with his character and how he wanted payback. My issue was actually just why it had to happen at all. I was on a bit of a high with this series after Fever of the Bone, and now I feel a little more wary and like no one is safe. Though definitely not enough to put me off. I liked seeing Carol's more human side. Normally she's quite closed off to anyone but Tony, but in this book things happened that meant she just couldn't hold it in like normal and it definitely made her seem more human. Tony on the other hand...I get that he's different and doesn't think "normally" but actually he seemed to lack a little empathy. Just when the reader's seen all the twists that McDermid could posit in her novels, a new take on an oft-told storyline makes for another must-read novel. Through a series of cost-saving measures, the MIT is about to be dismantled and its team assigned to other forces. Until then, DCI Jordan embarks on a case to discover who is behind a number of prostitute slayings in and around Bradfield. Each woman is slain in a unique way, leaving the team to wonder if there is a connection. With a similar ' Just when the reader's seen all the twists that McDermid could posit in her novels, a new take on an oft-told storyline makes for another must-read novel. Through a series of cost-saving measures, the MIT is about to be dismantled and its team assigned to other forces. Until then, DCI Jordan embarks on a case to discover who is behind a number of prostitute slayings in and around Bradfield. Each woman is slain in a unique way, leaving the team to wonder if there is a connection. With a similar 'MINE' tattoo left on each woman, the connection appears strong, but motive and suspects come up dry. While Jordan and the team seek to use this swan song case to show their worth, news comes that convicted killer, Jacko Vance, has escaped. Having been behind bars for over a decade, Vance is set to settle scores (seeking his own form of 'retribution', as the book's title suggests) with those responsible for his time in jail, namely DCI Jordan and Dr. Hill. While Vance keeps a low profile, plotting his revenge, Hill and Jordan are on high alert, trying to guess his next move. Vance's plot begin to play out, striking at the core of those who played a great role in his incarceration. While the horrors heighten, Jordan and Hill commence a strain on their relationship (however it might be defined), with reconciliation far from certain. With the MIT on shaky ground, two serial killers on the loose, and the Hill-Jordan bond in shambles, McDermid recounts a powerful story where racing against the clock may not fix all issues at hand. A thrilling resurrection of McDermid's most cunning killer in this page-turner, in which series fans get a much needed thrill and dose of horror all at once. McDermid's seventh novel does not lessen its thriller impact, even with the revisited characters and somewhat predicted storyline, as insinuated in the title. An avid series reader might have hoped for something along these lines, as it forces both Hill and Jordan to revisit their early time together and what began the effective 'specialist team' angle that has worked so well for the novels, as well as for both its main characters. With a blatant discussion of Jordan's stress coping mechanism, the infallibility scorecard is finally evened. While numerous authors have brought back old nemeses to to battle with their protagonists, few have the ability to tackle so nefarious a villain in as graphic a way as McDermid has done. All while balancing an alternative story line that keeps the reader guessing from the outset.